This is good news for Human Resource (HR) Personnel, employers as well as employees in the Philippines. 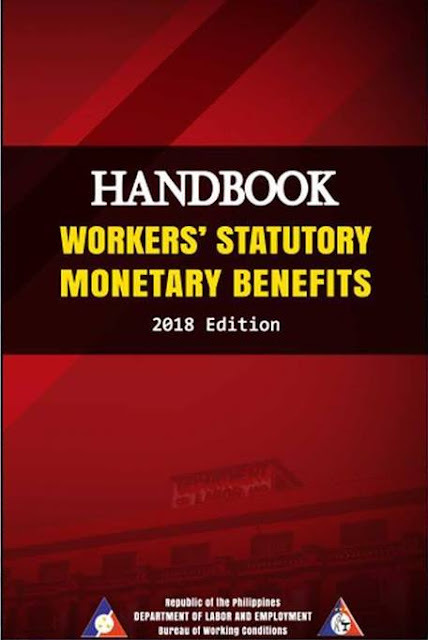 The Department of Labor and Employment – Bureau of Working Conditions (DOLE-BWC) has released the very helpful Handbook on Workers’ Statutory Monetary Benefits (2018 Edition). It is now available online for FREE via the official website of the DOLE-BWC. The handbook covers the following: minimum wage, leaves, separation and retirement pay including SSS, Philhealth and Pag Ibig benefits. This would be a very helpful reference for HR people and employers as well as employees. Click to download HERE a FREE copy of the DOLE-BWC Handbook on Workers’ Statutory Monetary Benefits (2018 Edition). How to claim the said benefits for ofw working 1990 to 2018? I think you would have to ask OWWA about that. Try checking their official website here: https://www.owwa.gov.ph/ and inquire from them. I worked in a bpo company and they have referral program where they are giving referral incentives to those active employees who will be able to refer someone and get them hired, i should have that referral incentives before i left the company but they hold the incentives and told me that the incentives will be forfeit since i am no longer active in the company. Do i still have rights to claim for that referral incentives that i should get in the first place? I’m not really sure about your situation. Perhaps you can get advice from a lawyer. May I know if there is a standard or mandatory numbers of leave credits in the Philippines? By the way I am a regular employee 3 years in service in a private company here in Manila. The government has different number of days or leave credits than that of private companies. In private companies, I think the minimum is 5 days for paid vacation leave. Per my experience, I have worked in a private firm where I had up to 10 days of paid vacation leaves and I have also tried working in another one which only gave 5 days of paid vacation leaves. Is there IL deduction if you’re on a maternity leave? What do you mean by IL? I am only familiar with SL and VL.